The Best Montreal blogs from thousands of top Montreal blogs in our index using search and social metrics. Data will be refreshed once a week. 2.32 MTL Blurb ⋆ Montréal's Own! Montreal newsletter is a comprehensive summary of the day's most important blog posts and news articles from the best Montreal websites on the web, and delivered to your email inbox each morning. To subscribe, simply provide us with your email address. Montreal, Canada About Blog MTL Blog has become one of Montreal's leading English, online, media publishing companies. Showcasing interesting things from Montreal. Cover the coolest events around Montreal. Facebook fans 339,541. Twitter followers 110,579. Montreal, Quebec, Canada About Blog The Montreal Restaurant, Bar, and Nightlife Blog. Food news and dining guides for Montreal. Facebook fans 15,768. Twitter followers 7,668. Montreal About Blog Plan your outings to Montreal with a calendar of events and a directory of establishments. NIGHTLIFE.CA is the reference to enjoy urban and cultural life in Montreal. Facebook fans 113,412. Twitter followers 60,547. #Montreal About Blog Your best source for quality Montreal Canadiens news, rumors, analysis, stats and scores from the fan perspective. Facebook fans 36,555. Twitter followers 12,721. Montreal, Quebec About Blog Cult MTL delivers daily coverage of Montreal's cultural scene, from music and nightlife news to artist profiles to politics and lifestyle columns to event listings and recommendations for things to do. Facebook fans 20,963. Twitter followers 75,961. Montreal, Quebec About Blog Montreal's travel deal community. Find cheap flights, holiday packages, and all inclusive vacations from YUL. Featuring articles, guides, alerts, forums, discount promo codes, sales and more. Facebook fans 13,715. Twitter followers 3,366. Montreal About Blog Ranked #1 Food Tour! Eat Montreal's most delicious foods on a Montreal Food Tour through the Mile-End & Old Montreal. View our Montreal Tours now! Facebook fans 2,332. Twitter followers 936. San Francisco, CA About Blog A community for Montreal and its loving residents. We speak French too! Une communauté pour Montréal et ses résidents bien aimés. On parle anglais aussi! Facebook fans 1,162,691. Twitter followers 520,412. Montreal, Canada About Blog She loves biscotti is about sharing good, simple food with people that mean the most to you. It is a personal food blog where you will find some of Maria's favourite recipes. Some of these favourites are based on her Italian cultural heritage and others are just fantastic recipes she has collected along the way. Facebook fans 1,598. Twitter followers 1,147. About Blog Urbanizer Montréal proudly showcases the best content from the city: trendy articles and videos, tips and lists to connect with amazing places in your city thanks to top local bloggers. Facebook fans 610. Twitter followers n/a. Montréal, Québec About Blog Welcome to the three-day immersive event that will transform the way you do business. C2 brings together commerce and creativity to explore trends, opportunities, disruptions and major shifts on the horizon. Facebook fans 33,003. Twitter followers 1,598. San Francisco, CA About Blog Welcome to the subreddit of the NHL's oldest franchise, the 24-time Stanley Cup Champions, the Montreal Canadiens. Facebook fans 1,162,691. Twitter followers 520,415. Montréal, Québec About Blog MTLinTECH aims to build the platform that will allow Montreal to shine outside the province and the country, by sharing with the world the host of things happening in Montreal's thriving tech and startup community. Facebook fans 3,130. Twitter followers 1,779. Montreal About Blog Complete guide to new housing in Quebec. Check out our detailed list of condos, homes, and lofts for an informed purchase. Facebook fans 8,833. Twitter followers 309. Montreal About Blog Finaliste du prix du «Meilleur centre de congrès au monde», le Palais des congrès de Montréal vous propose un emplacement exceptionnel au cœur de Montréal. Facebook fans 14,902. Twitter followers 3,666. About Blog We at Best Kept Montreal are the leading source for all the hidden gems of Montreal. From underground parties & music concerts to fashion festivals, we cover everything! Facebook fans 10,400. Twitter followers 17,150. Facebook fans 42,828. Twitter followers 72,829. Montreal, Can, International About Blog We strive to change the media paradigm from one of labels and borders to one of thoughts and ideas. We challenge our audience by pursuing current, unconventional and edgy concepts through an online medium. Facebook fans 2,665. Twitter followers 1,415. Montreal About Blog Montreal Rampage is a daily blog that publishes about the art, festivals, music, theatre, film, food, events, dance, culture and happenings in Montreal. Facebook fans 1,188. Twitter followers 670. Montréal, Québec About Blog Welcome to Shupilov Real Estate. Trusted by buyers, sellers and investors across Montreal. Start building your real estate portfolio with us today! Facebook fans 3,121. Twitter followers 25. Montreal About Blog The Food Divas have been frequenting Montreal restaurants on Thursdays since November 2011. Montreal is known for its French cuisine (and we love our tartare), so we tend to go to French restaurants. Facebook fans 1,908. Twitter followers 2,853. Facebook fans 7,611. Twitter followers 339. Montréal, Québec About Blog Haunted Montreal Ghost Tours/ Montréal hanté​ take place on Mount Royal, Downtown and in Griffintown! The monthly Haunted Montreal Blog complements the ghost walks. Facebook fans 9,660. Twitter followers 11. About Blog It's Montreal's Official Online Dog Park! As a community of pet lovers, we may have differing opinions - but that's what helps us learn! Facebook fans 8,159. Twitter followers 304. Montreal About Blog A Montreal lifestyle, food & fashion blog written by a stylish Montreal Mom. The best in restaurants, boutiques, beauty, decor, and kids. Facebook fans 1,160. Twitter followers 1,538. Montreal, Canada About Blog Blog about the changing urban face of Montreal. Montreal About Blog The Montreal Review of Books reviews books published in English in Quebec; we aim to give a clear voice to Quebec’s literary community. The mRb covers literature, non-fiction, poetry, memoirs, history, graphic novels, children’s books, and more. Facebook fans 1,121. Twitter followers 2,280. Montreal, Canada About Blog CrossFit Montreal is the first CrossFit Affiliate centre in Quebec, and continues to provide excellence and to be a reference for Crossfit in Quebec. Facebook fans 2,742. Twitter followers 181. 32. MTL Blurb ⋆ Montréal's Own! Montréal, Québec About Blog MTL Blurb aims to create engaging and consumable Montreal-centric short form content while providing a new honest platform for content creators and advertisers alike. Facebook fans 15,381. Twitter followers 177. About Blog Coolooplis is where untold, forgotten and weird stories of past and present Montreal are woven. Facebook fans 1,145. Twitter followers 2,304. Montreal, Quebec About Blog Montreal news, a feed from Montreal City Weblog. Facebook fans n/a. Twitter followers 6,995. Montréal, Québec About Blog This blog is made of a team of contributors that all share their love for Montreal but have different passion and hobbies. Facebook fans 578. Twitter followers 1,514. 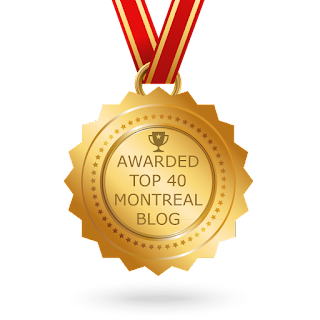 CONGRATULATIONS to every blogger that has made this Top Montreal Blogs list! This is the most comprehensive list of best Montreal blogs on the internet and I’m honoured to have you as part of this! I personally give you a high-five and want to thank you for your contribution to this world.